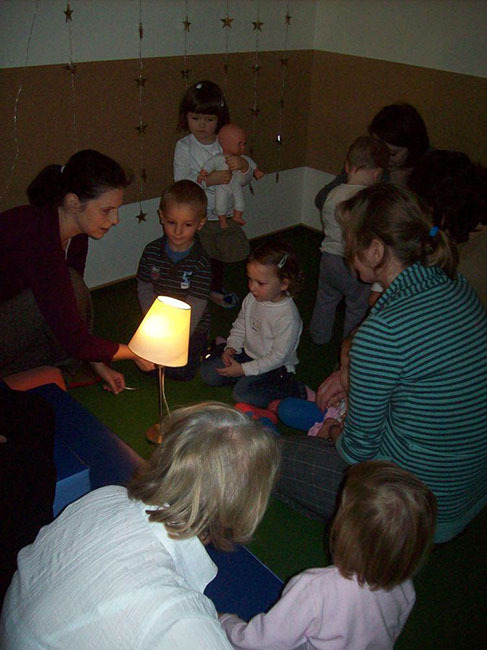 A group of children 18 months to 3 years old and their parents studied lights in a preschool program at the Astrid Lindgren Institute for Early Childhood Development in Poland. The goal of the preschool program is to help children gain positive social experience through safe and interesting contact with a new group of children and adults in the supportive presence of their parents. The article describes the three phases of the Lights Pre-project and discusses the benefits to the children, parents, and teachers who participated. The Astrid Lindgren Institute for Early Childhood Development (ALI) is a nongovernment organization located in Poznan, Poland. It has been in operation since 1993. The ALI consists of a team of interdisciplinary specialists in psychology, sociology, education, and early childhood education. 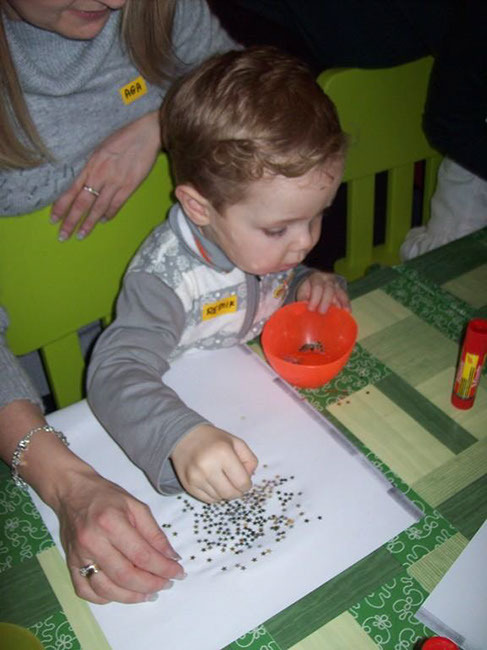 The ALI cooperates with other organizations and institutions in Poland and internationally to support the development and education of young children. Its mission is to build “a culture of the young child” as the foundation for creating a democratic society (Figure 1). Figure 1. 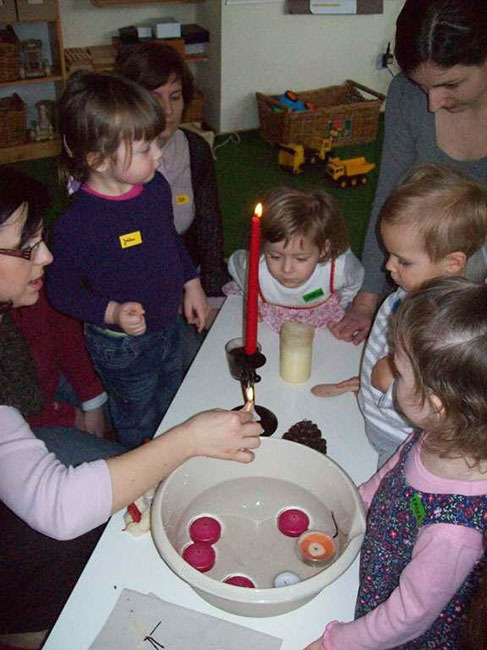 Toddlers attending the Astrid Lindgren Institute for Early Childhood Development. Figure 2 shows the various areas of the ALI’s work. The institute supports the development of young children and their families by providing play experiences for children from birth to age 5, offering classes and workshops for parents and caregivers, and intentionally allowing for parents’ participation in the children’s activities. Support for the educational environment is provided through training for educators and others who work with young children. The ALI’s civic and social involvement includes promoting a “Support for the Start” campaign and creating and disseminating model solutions to problems in the field. Figure 2: ALI’s scope of work. The ALI philosophy focuses on respecting a child’s needs and rights in all aspects of the social space—the family, education, and community (Figure 3). Figure 3. Children at the ALI painting together. The activities described in this report took place in the Club of the 2-Year-Old (K2), ALI’s proprietary program of developmental classes for children from 18 months to 3 years of age, and their parents. 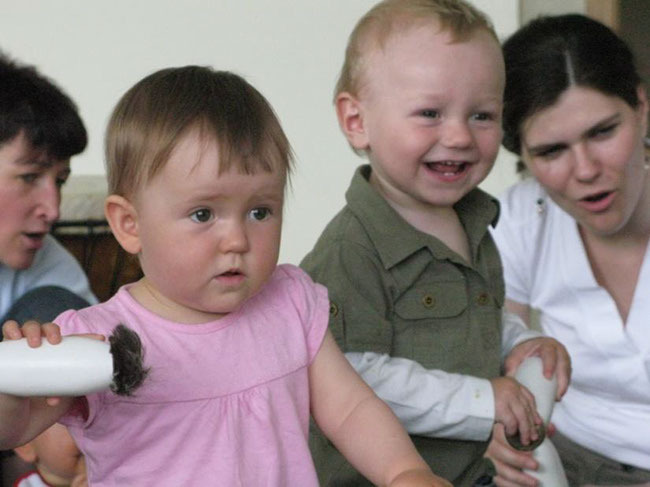 Participating in K2 enables children to gain positive social experience through safe and interesting contact with a new group of children and adults in the supportive presence of their parents. K2 classes are designed to help children develop their curiosity about the world, their autonomy, and their independence. 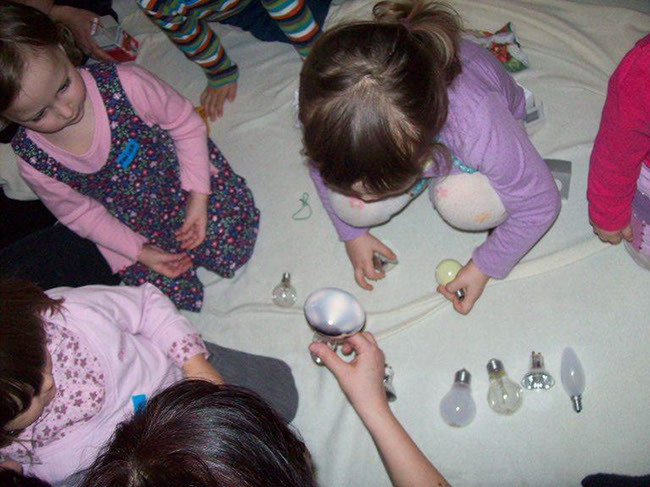 They experiment with various materials, engaging all their senses and their imaginations. In K2, adults support their children by accompanying them actively during the classes, as well as sharing their experience with other parents and supporting them. Meetings with parents are an integral part of the K2 program, promoting cooperation between the ALI staff members and parents. The meetings also provide an opportunity for parents and teachers to exchange information and to talk about important and current matters in children’s development. The Project Approach is a part of the curriculum in the ALI program. 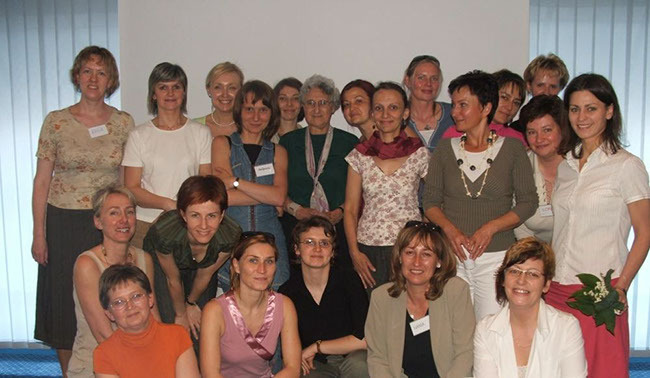 During 2005-2008, Professor Lilian Katz of the University of Illinois at Urbana-Champaign trained ALI staff and teachers from four pilot preschools in the implementation of the Project Approach (Figure 4). Dr. Katz also prepared four ALI trainers to teach the Project Approach and to supervise teachers who work with the Project Approach. Figure 4. Dr. Katz, center, with a group of ALI staff trained in the Project Approach. Classes were then implemented at ALI based on using the Project Approach with children between 1 year 5 months and 5 years of age. Training was provided for professionals working with young children (110 teachers from 28 preschools, and 4 trainers from Germany). At ALI, projects are done with children between 3 and 5 years of age. 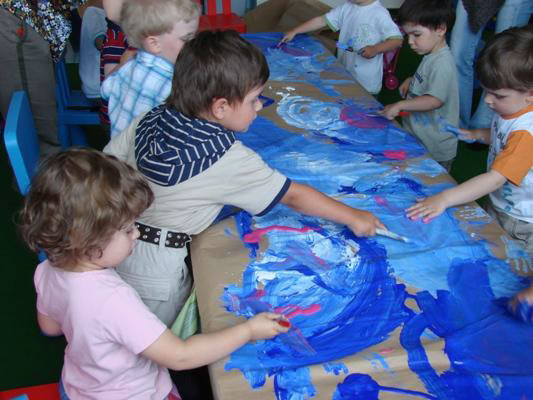 Pre-projects are undertaken with children between 1 year 5 months and 3 years of age. 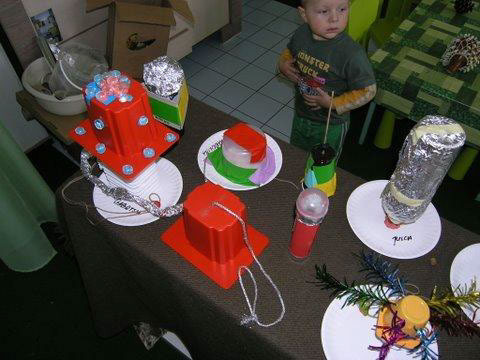 Pre-projects are an original modification of the Project Approach developed by ALI; they are considered a way for very young children to investigate and get to know the world. 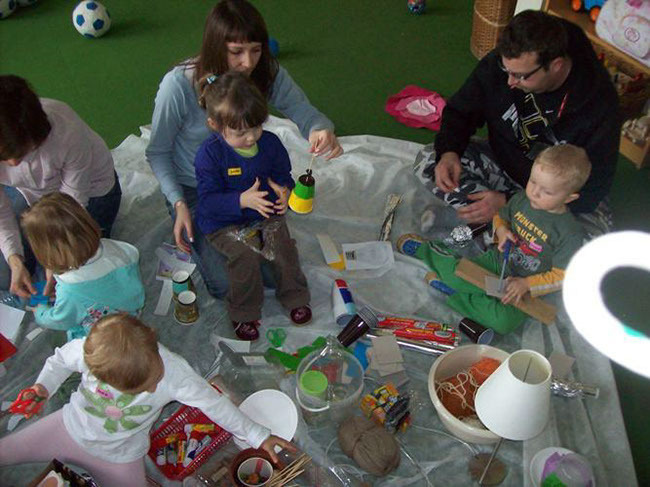 In the years 2007–2009, 630 families participated; the parents attended the Project Approach introductory meeting and then were with their children in classes using the Project Approach. All parents participate in an introductory meeting about the Project Approach prior to implementation of pre-projects in the Club of the 2-Year-Old (K2) and of projects in preschool groups. This meeting is the occasion for presenting the Project Approach—what its essence is, what will support the children’s learning processes, what the phases of the project are, and what the roles of teachers and parents are during a project’s implementation. Pre-projects and projects differ in several ways—the ages of the participating children, the roles of the teacher, the level of parent engagement, the course of the phases of project work, the ways in which the children participate, the types of research activities used in their investigations, and the ways that they express or represent their newly gained information. 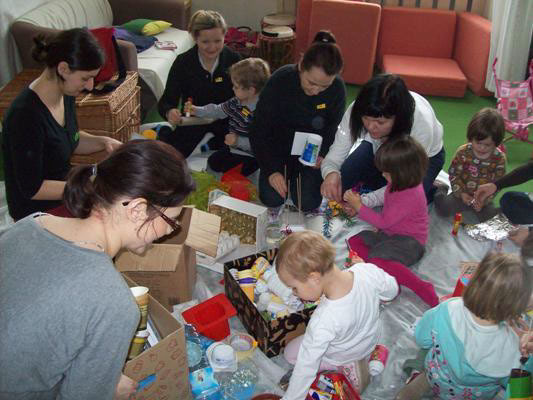 Also in preschool groups doing projects, parents do not stay with their children during the project implementation. Their role is different; they are primarily involved in getting materials and resources, finding experts, and supporting their children in further investigating the topic at home. Parents of children of any age participate with children in the closing phase of the project—in its summary and celebration. 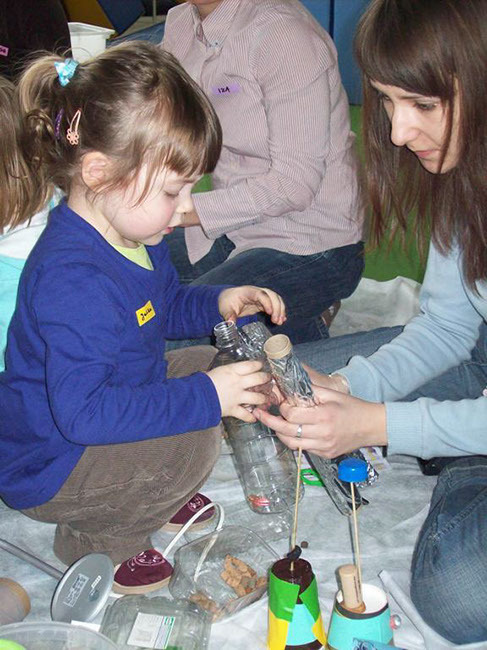 Parents are active and engaged in each phase of project implementation—choosing the topic, planning activities, supporting children, and celebrating what the children have done and learned. 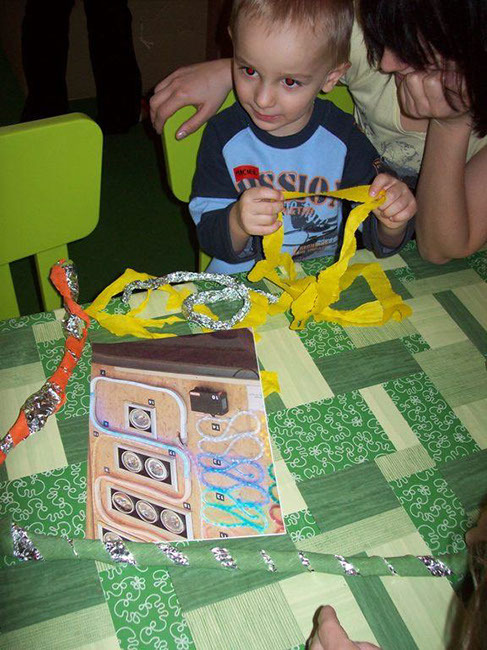 Choosing the subjects of the pre-projects is carried out in the Club of the 2-Year-Old. The parents’ cooperation and involvement in projects is important for several reasons. Active participation of children is often dependent on participation of their parents. Parents are also essential to the transfer of knowledge and experiences from K2 to the home environment. 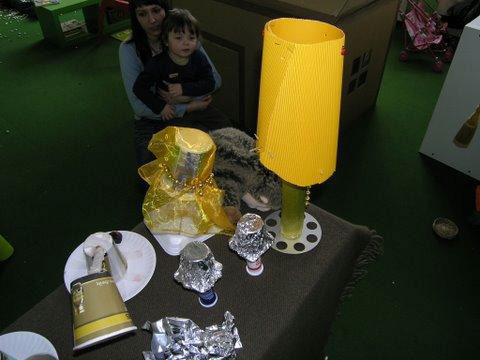 The Lights Pre-project was carried out within the Club of the 2-Year-Old (K2) over a period of 4 months. Children and families met once a week for 90 minutes. The pre-project was implemented independently in two groups. Altogether, 24 children and 24 parents participated (12 children and 12 parents in each group). Some activities differed between the two groups, but many were similar. 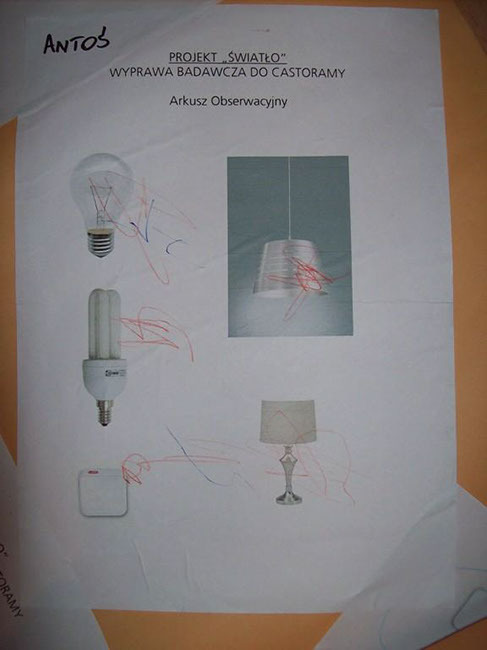 Four teachers were involved with the Lights Pre-project—Katarzyna Grzegorzewska, Małgorzata Nadolska, Jagoda Konieczna-Blicharz, and Ilona Żurawska. Phase 1 begins with the choice of a project topic. Usually the subjects are chosen during the Project Approach introductory meeting or during the K2 meeting. We tell the parents about the sample projects implemented in ALI and ask them about their children’s interests and fascinations, their favorite games and toys. Based on these interests, the teachers create some ideas for possible topics to investigate. If there are more suggestions, the final decision is made based upon resources available to ALI and the parents and by a group vote. Topics addressed during K2 meetings have included a car, bread, dough, water, instruments, a ball, and an egg. 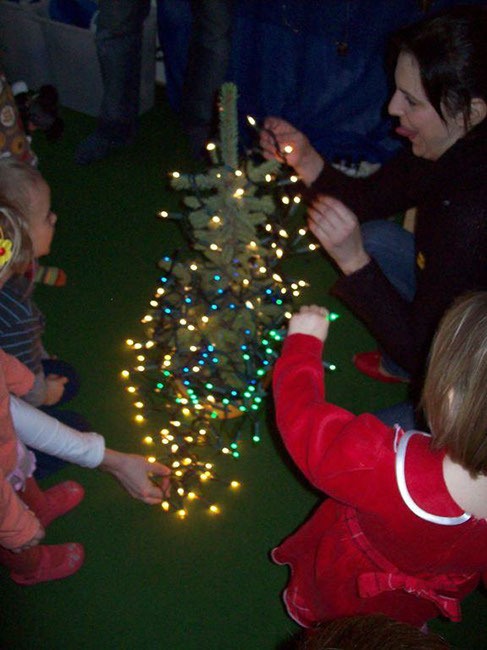 In the case of the Lights Pre-project, the initiative came from one of mothers, who remembered playgroup classes in which the children interacted with Christmas tree lights. The extraordinary interest of all the children was engraved in her memory. 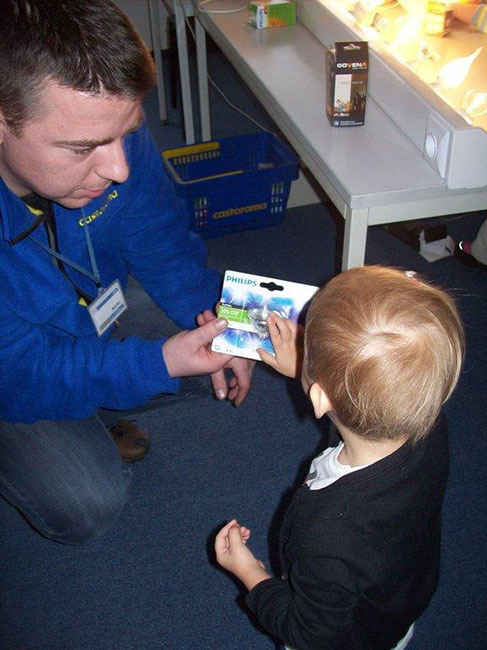 Part of the teacher’s role at the beginning of the project was to identify the children’s current knowledge about and understanding of lights. An important first step was finding out whether the children were interested in the subject. 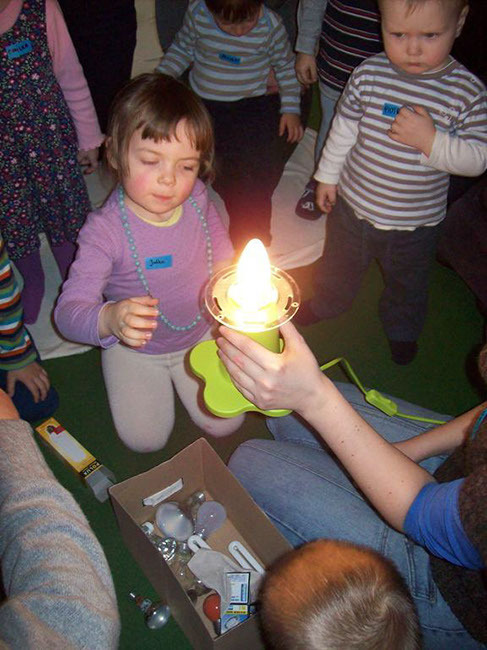 To do so, the teachers introduced play activities related to lights. 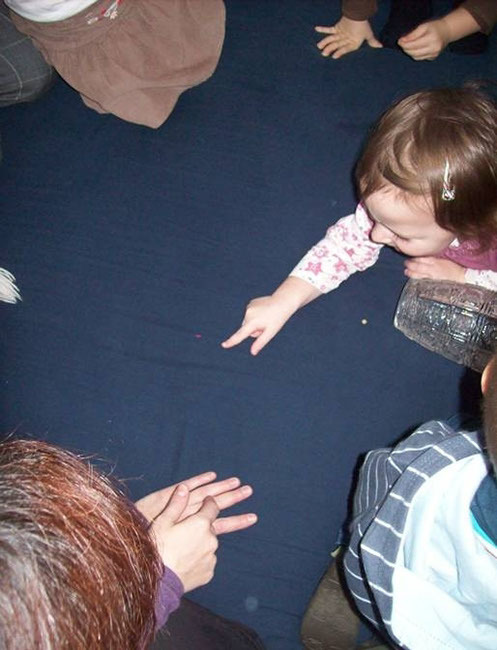 (See Figures 5 and 6, in which children explore flashlights.) The next step was to observe and talk with the children to discover what they already knew and what they wanted to find out. Figures 5 & 6. 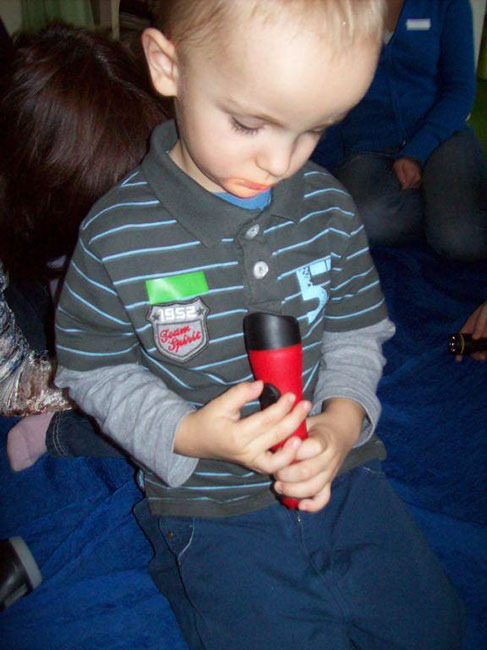 Children exploring flashlights. “What shines in our classroom?” was one of our first research questions during Phase 2 (Figures 7 & 8). Figure 9. 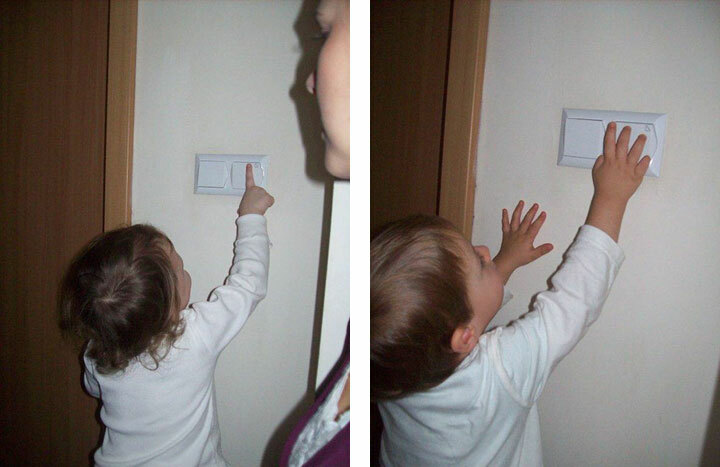 Toddlers discovering a wall switch. The children saw that they could influence their environment, and it was evident that often they felt proud of what they could do. The children also had opportunities to stay focused on a specific activity for a long time if they found it interesting. Another exploration, and some experiments, involved Christmas tree lights. 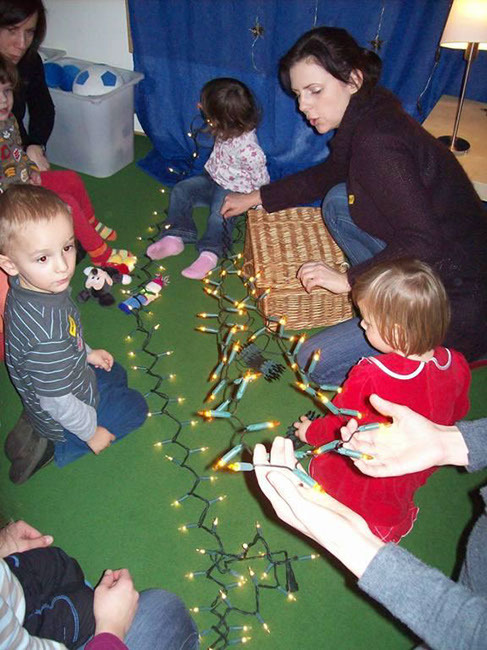 The children and adults examined different strands of lights together (Figures 10-12). Figures 10-12. Exploring Christmas tree lights. 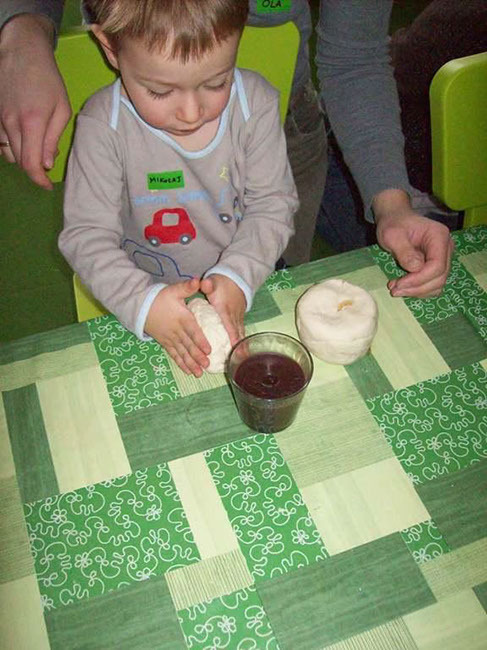 The teachers noted that as a result of these experiments the children showed new knowledge and understandings. The children learned more words related to the Christmas tree lights, their colors, and how they operate. They observed that some lights did not shine because they were burnt out and that adults could replace the burned-out lights with bulbs that worked. 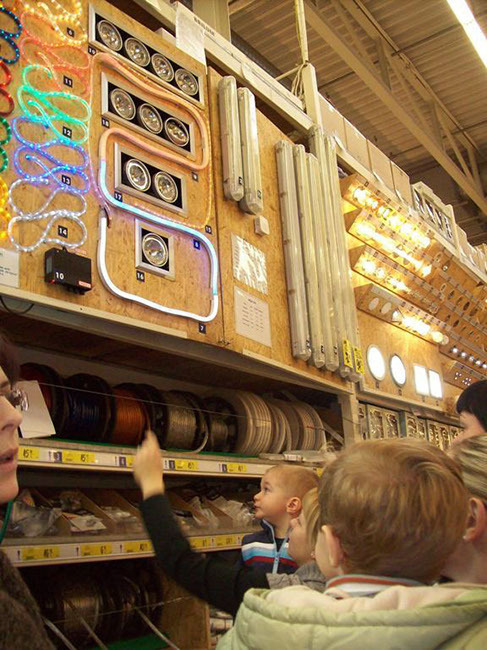 The children also had many opportunities to observe attentively, to pay attention to details, and to make comparisons among the different types of lights. They seemed to be growing more comfortable with talking to adults other than those in their own families. They also seemed to be learning how to ask questions. Figure 13. 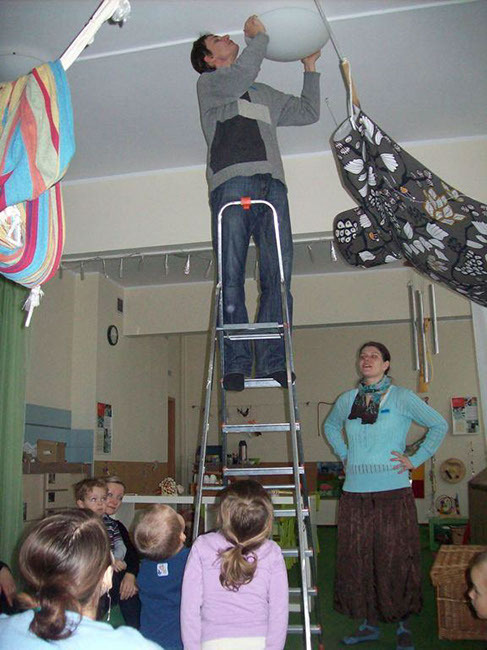 Children observing while an adult changes a lightbulb. Figures 14 & 15. 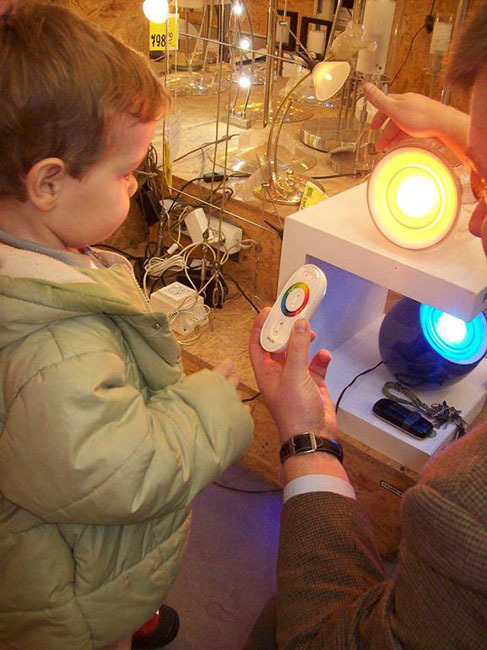 Toddlers examining different kinds of lightbulbs. Figures 16 & 17. 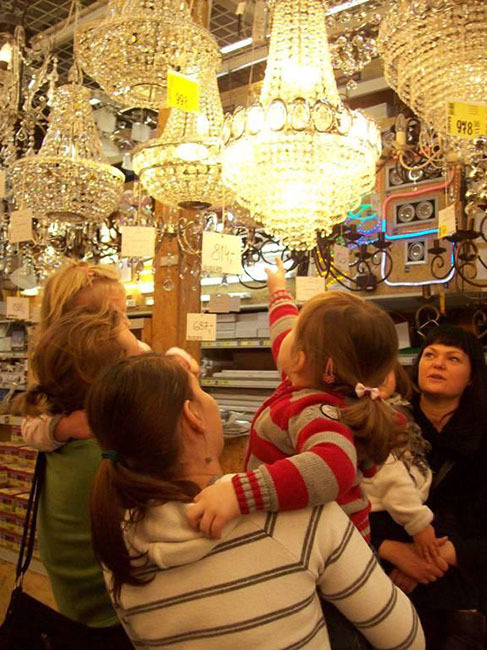 Toddlers observing how lights work. The teachers reflected that during the Phase 2 activities mentioned above, the children gained additional knowledge and understanding. They got to know various kinds of lightbulbs and check what they looked like, comparing colors, size, and shapes. They observed the processes involved in changing lightbulbs. They had opportunities to cooperate and to put things in order. The children also showed traits of “little researchers”—showing curiosity, watching carefully and sometimes asking questions, and checking their own ideas. 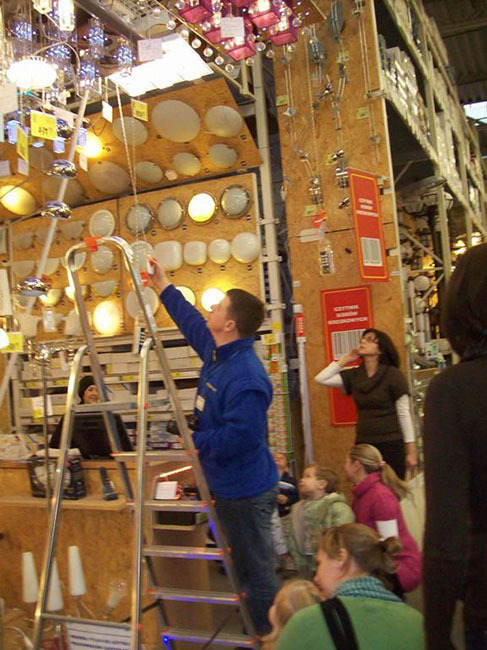 A field trip to the “Castorama” store provided the children and their parents with more opportunities to watch, do research, and learn (Figures 18-24). During the field trip, they had contact with an expert who could answer questions and many occasions for making sketches (Figures 25-27). Figures 18-20. Toddlers and their parents on a field trip to Castorama. Figures 21 & 22. Looking at lights at Castorama. Figures 23 & 24. 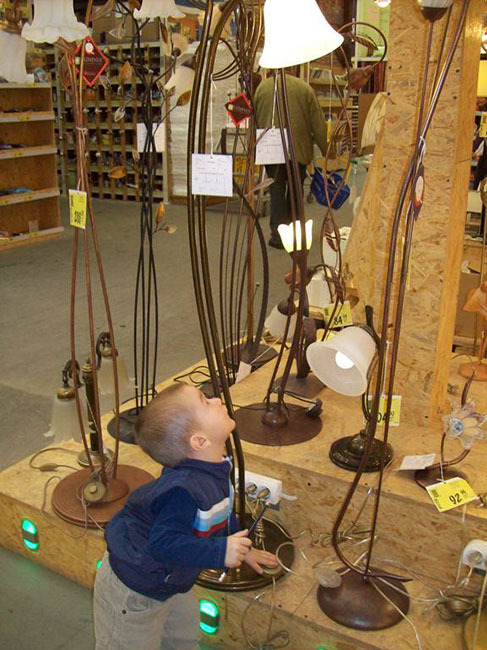 Children examining small parts of lighting systems. Figures 25-27. 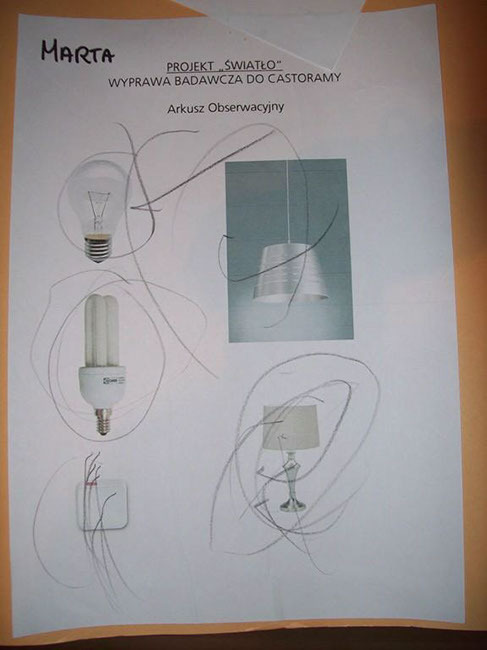 Children’s sketches of lights and lighting systems at Castorama. Figures 28-29. Observation sheets for visit to Castorama. The children also were able to see that they could make discoveries in new places and circumstances, such as at home or during a walk with a parent. They saw that other people are interested in their discoveries and that they can talk to other adults and children about what they learn. 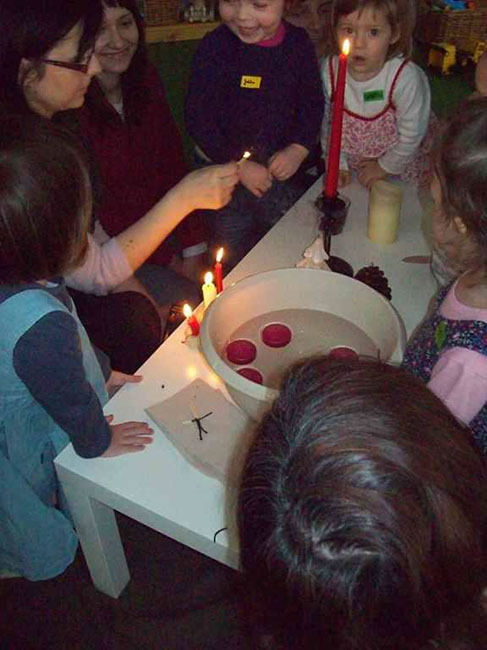 During Phase 2, adults brought in a variety of candles and lit them for the children to observe (Figures 30 & 31). 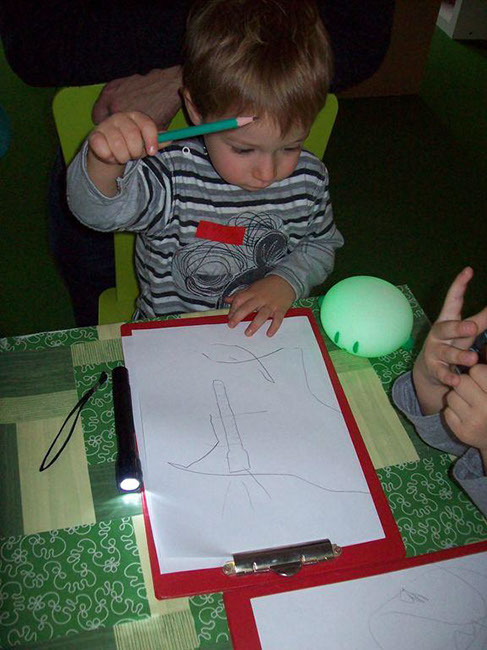 Other new activities during this phase included use of a laser and a projector to help children explore other light sources (Figures 32 & 33). Figures 30 & 31. 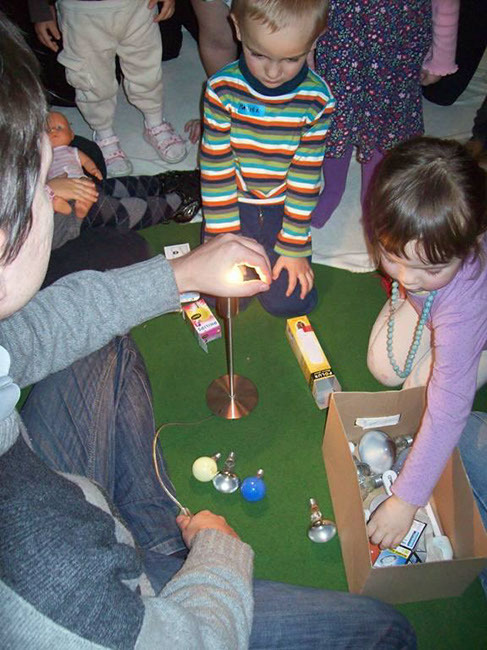 A group of children and adults investigating candles. Figures 32 & 33. 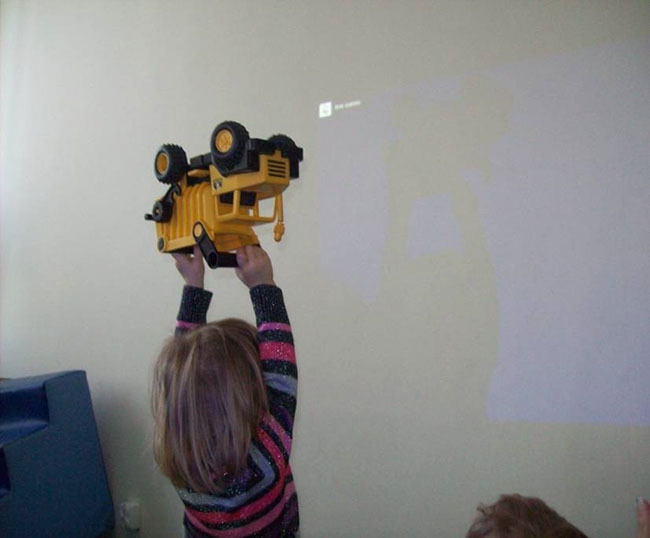 Children investigating light from a laser pointer and from a projector. During Phase 2, the children expressed what they were learning in several different ways. They sketched and/or copied pictures of torches, and they drew the shadows cast by the lamps on the ceiling (Figures 34 & 35). They put together a jigsaw puzzle with lamp photos. By sticking colorful circles to a piece of paper, they made representations of Christmas tree lights (Figures 36 & 37). 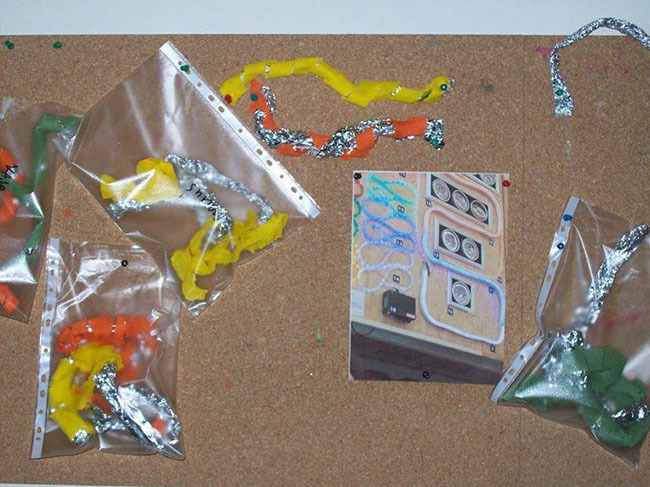 With some adult help, children built a rope light from aluminum foil and colored papers (Figures 38-40). They made lamps, candles, and candlesticks using salt dough (Figures 41-43). Together with their parents, the children built lamps. Figures 34-35. 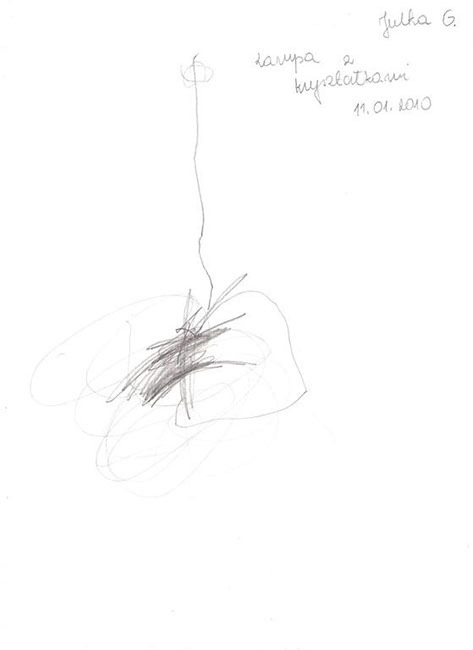 Children sketching and drawing. Figures 36 & 37. Using art materials to represent Christmas tree lights. Figures 38-40. Children making representations of rope lights. Figures 41-43. Children making representations of candles and candlesticks. 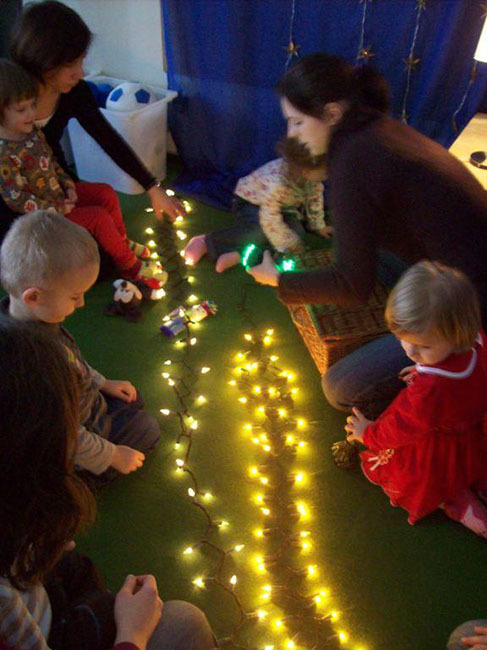 During this part of Phase 2, the children had opportunities to play on their own with unusual materials to create representations of lights. 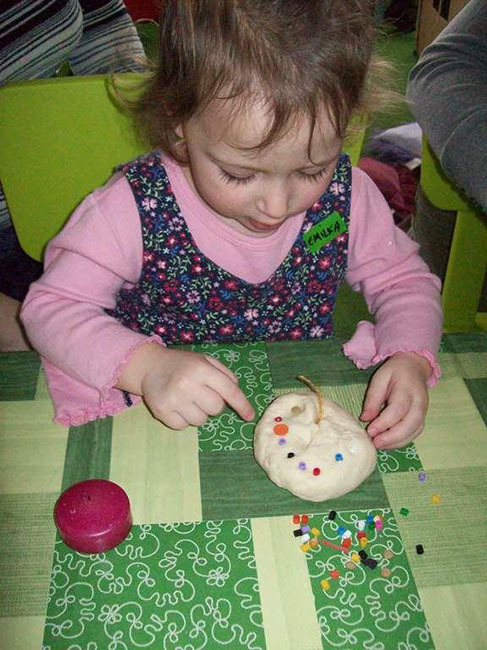 Drawing, molding, and building various lights can help them to remember what they have learned about the lights. Cooperative activities such as making models of lamps with family members can lead to extraordinary results (Figures 44-48). 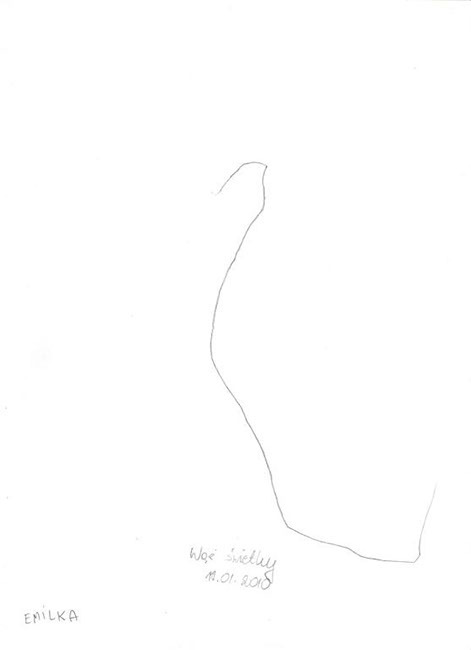 Figures 44-46. 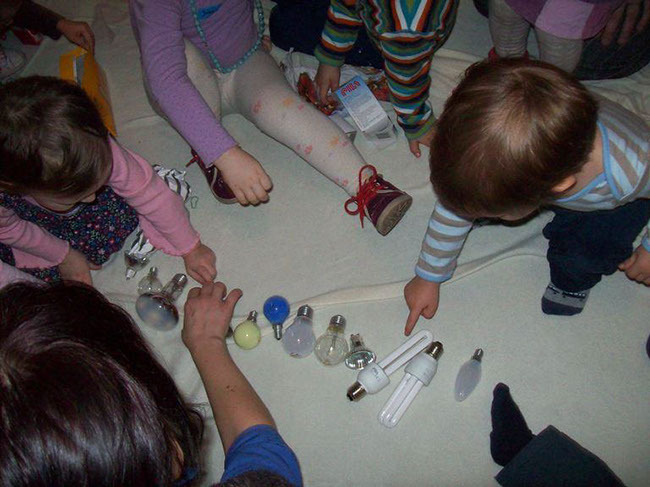 Children and adults building representations of lamps together. Figures 47 & 48. Looking at the completed lamps. During Phase 3, the pre-project came to a close. Culminating activities included a Lights Festival and a celebration. Each child also received a certificate for participation. All the children, their parents, and teachers gathered for the Lights Festival. Once again, the adults and children could see all the light equipment that they had gotten to know during the pre-project (various lamps, hand torches, candles, etc.) and the photos from the field trip and the project activities. 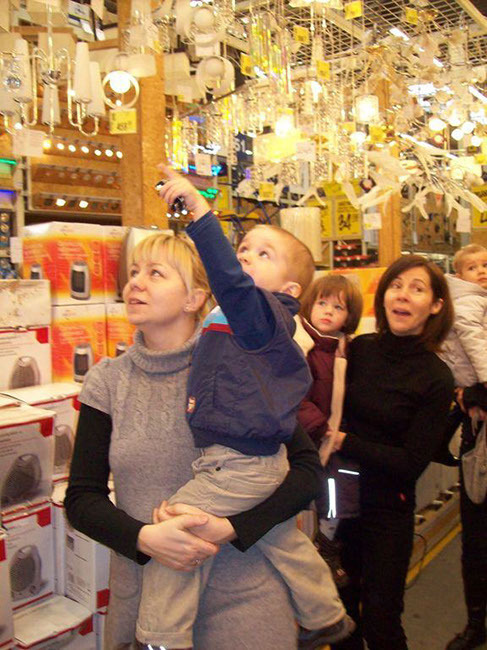 Children could freely explore the lamp equipment and the photos. With their parents, they decorated hand torches (flashlights) with colored papers and foil. Then everybody played and danced with the torches. The children had opportunities during these activities to feel appreciated for their engagement and to have fun with peers and families during joint celebrations. The culminating activities also gave the children a chance to revisit all that they have learned, seen, and experienced. The Lights Pre-project seemed to have a number of benefits for the children who participated. The teachers noticed that the children developed an open attitude toward the world, based on curiosity, independent activity, and engagement with the “real world.” The children also saw that their interests and activities were valued by adults and peers, which may lead to an increased sense of self-worth. Their participation seemed to involve developing sensitivity to the surrounding world through opportunities to get to know it in an active and interesting way. The teachers also noted children’s increased skills and knowledge in social, emotional, and cognitive areas and their increasing ability to adapt to new and changing circumstances. The children also seemed to be developing a greater sense of responsibility both for the process of independent learning and for the results of their own activities. Many of the parents expressed feelings of pride and joy while watching the children’s development, achievements, and enjoyment of their participation in the pre-project. The teachers who participated in the Lights Pre-project reflected that it was beneficial to them in several ways. They perceived themselves as developing an open attitude toward the experience of leading projects and greater skill in leading groups based on active participation of their members. The teachers also found that being able to draw from parents’ and experts’ ideas allowed them to expand the available workspace and materials. Engagement in the pre-project also counteracted the routine and “burnout” by fostering the teachers’ development of creativity and flexibility. The teachers also reported an increased feeling of professional success, a sense of usefulness, and the gratification of seeing visible results of their own work on the project. 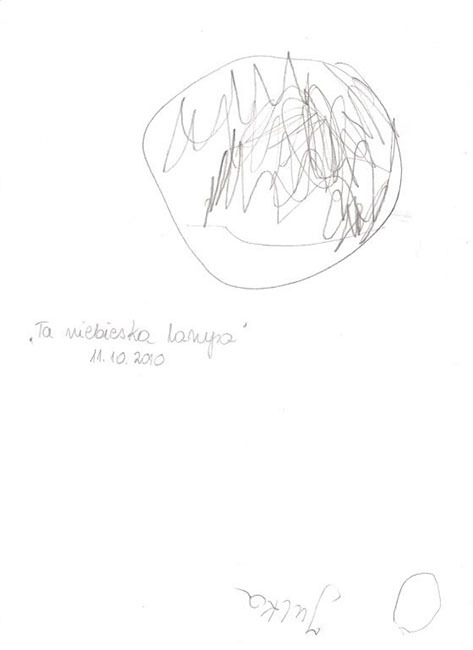 Katarzyna Grzegorzewska is a psychologist and a graduate of Adam Mickiewicz University in Poznan. 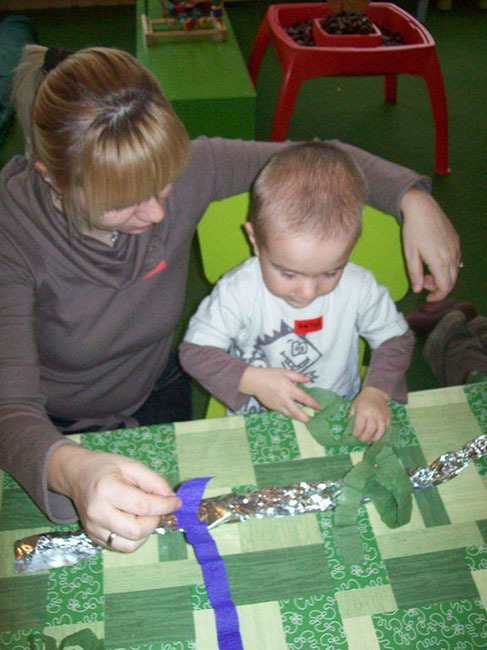 Mrs. Grzegorzewska has worked for the Astrid Lindgren Institute for Early Childhood Development since 2009, leading activities for children from birth to 3 years of age (Play Groups and Club of the 2-Year-Old). Mrs. Grzegorzewska also leads workshops for parents and for women. She is the mother of two children. Jagoda Konieczna-Blicharz is a psychologist and a graduate of Adam Mickiewicz University in Poznan. 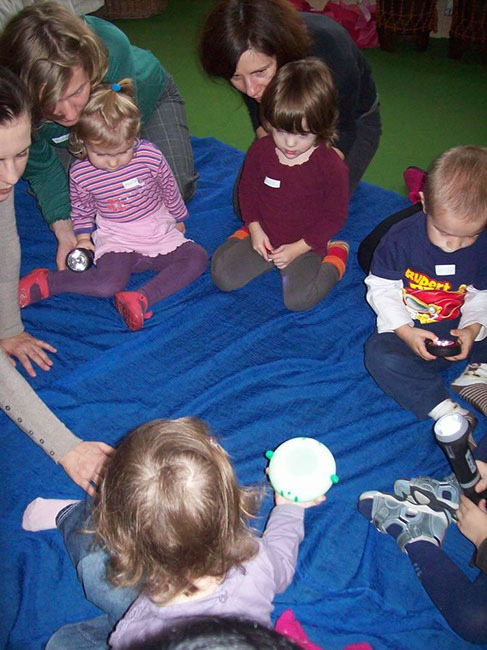 Mrs. Blicharz has worked at the Astrid Lindgren Institute for Early Childhood Development since 2007, leading activities for children from birth to 3 years of age (Play Groups and Club of the 2-Year-Old). She also creates programs for young children in the area of early childhood development and early childhood education. She has a 1-year-old daughter.